An easy way to prevent pest infestations is not to introduce them in the first place. This is easier said than done. Insects and mites (not insects since they are related to spiders) can easily be brought in with new plants or can hitchhike onto your plants from others on show tables. Don't hesitate to scrutinize other orchids at shows and point out pests or diseases to show officials. Inspecting, repotting, and isolating new plants will help eliminate pest and disease introduction. Appropriate cultural conditions will keep plants healthy and enable plants to fight off mild attacks. If you discover pests or diseases on your orchids, it is best to act quickly. If the problem is isolated on one or a couple plants, they can be separated from the rest. If the problem is widespread on a good portion of your collection, treat all of your plants. We try to use mild treatments first since we grow indoors and have pets. Regardless of chosen controls, be sure to follow the manufacturer's instructions. Usually, several applications several days apart are recommended. This is important since insect eggs may survive even if all the adults were eliminated. Resistant pests or diseases may arise in your collection if follow-up applications are not applied. Rotating treatments will help prevent resistant strains from developing, but if you find yourself treating constantly for fungus or bacterial problems, the issue may be ultimately cultural, and your growing habits should be thoroughly analyzed. Water droplets can act as a magnifying glass (ever burn ants by magnifying sunlight? ), so it is advisable not to apply sprayed-on pest or disease controls on sunny days or when temperatures may exceed eighty-five degrees Fahrenheit. Wetting agents such as spreader stickers or dish soap will improve the efficacy of most pest or disease sprays. Most controls require all exposed areas of the plants to be sprayed. Be sure to lift leaves to treat their undersides. Drenches or dunks may be necessary for problems at the root zone. Insect pests include several types scale, mealy bugs, thrips, and fungus gnats. Scale can be difficult to treat because of their protective covering. Mealy bugs seem to congregate close together so only the outer bugs in a stack may get treated, but adults are easily wiped away with soapy water or isopropyl alcohol. Thrips are attracted to bright colors, so their presence is usually seen as flower damage. The only time we've had problems with thrips was the spring after a mild winter when warmer than usual temperatures allowed many to survive the winter. Fungus gnats are likely the most obvious insects in orchid collections because the adults are slow-moving, fairly large, and dark in color. Adults are supposedly harmless, but larvae are said to damage roots and new green growth. Mites, arachnids not insects, are difficult to detect because of their small size. Spider mites will weave visible webs, but other types will not. Mites pierce into plant parts to feed, and collapsed cells result. We have found that mites seem to love Alocasia, African mask foliage plants, so we use them as indicator plants. They have large, flat, rather thin leaves that show mite damage quickly. We also wipe them with a damp paper towel once in a while. If we see black dots on the towel, they may be mites or their eggs. If the Alocasia have mites, we treat all the plants. Unlike many insects, mites prefer less humidity. 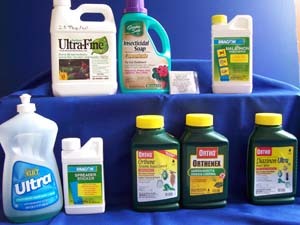 Horticultural Oil works safely by smothering pests. 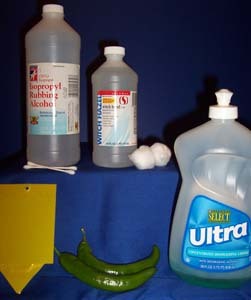 Insecticidal soap also smothers, and it breaks down pest exoskeletons. Neem oil smothers and is also reported to alter the life cycle of larval pests so they don't develop into adults, and neem additionally leaves a bad taste on plants that acts as a potent antifeedant. Hot pepper extracts work similarly to Neem. If these treatments are ineffective, try synthetic chemicals as a last resort according the label's instructions. Ants have not been a problem for us since we grow indoors; however, there are controls on the market for ants. Slugs and snails are another pest more common in greenhouses. We prevent their presence in our collection by repotting and inspecting new plants. Outdoor and greenhouse growers may at times experience problems with cockroaches and rodents for which several proprietary controls are available. Fungus and bacterial infections can be avoided by maintaining acceptable growing conditions and not overwatering. Just like humans, stressed plants are more susceptible to disease. If you see suspicious, dark discoloration on leaves or roots, it is usually best to cut the infected area away and treat the wound. Roots can be treated with commercial fungicides. 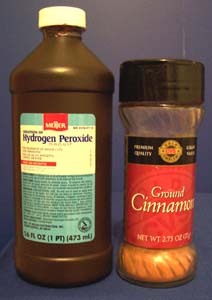 Cinnamon or commercial chemicals can be applied to wounds on leaves to prevent infection. Root rot is likely the most devastating orchid disease. It may occur as a result of poor culture, overwatering, or decayed potting media. Unfortunately, root rot has the same symptoms as dehydration from underwatering. In both cases the plant isn't getting enough water whether it be because there are no healthy roots to absorb it from the media or no water is available for the healthy roots to absorb. Repot plants with some healthy roots into fresh media, water well, then try to keep them in a humid area until root growth resumes. We use deep, clear plastic storage boxes for this. If you can not find storage boxes deep enough, invert one over another of the same size. Limit pot watering to help the damaged roots heal, dry out the infected area, and force new roots to grow down into the media in search of water. Crown rot is also brutal. It typically sets in when tight crowns remain wet when temperatures drop over night. Warering early in the day so crowns are dry bt evening, and proper air movement will help prevent crown rot. Fresh hydrogen peroxide can help rescue a plant with crown rot if it is caught early enough.